The frequency of problems caused by fiber optic tools is high: their poor design, improper use, poor condition or the unfamiliarity with their use all are sources of problems during installation. Installation tools include some big hardware like bucket trucks, trenchers, cable pullers or plows. The need for these will be established early in the planning stages. Many contractors do not own expensive equipment like this, finding it more cost effective to rent it as needed. If your crews are not familiar with a particular piece of equipment, subbing the work to someone who has both the equipment and an experienced crew may be much more cost effective, as mistakes in their operation can be disastrous – both costly and dangerous. Outside plant cables and premises singlemode cables will generally require fusion splicing for concatenation of long cable runs and splicing on pigtails for termination. 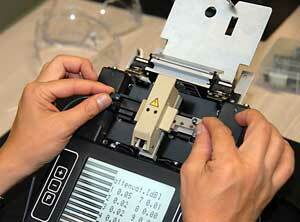 Since fusion splicers have become less costly, more contractors have purchased them. Other contractors who have fewer projects that require splicing prefer to rent them, knowing they are getting a splicer that is a newer model with the latest technology that has been recently serviced. The downside of a rental unit is your installers may not be familiar with that model and require some training or time to familiarize themselves with it. If you own your splicer, it’s assumed your crews are familiar with its operation and need only to inspect the unit to ensure it’s working properly and the arc electrodes are in good condition. 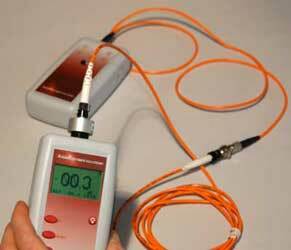 Most contractors own termination equipment for multimode fiber as it is used on most jobs. Generally contractors have a preferred method of termination, either adhesive/polish or prepolished/splice types. Either type requires dedicated toolkits. For epoxy or Hot Melt terminations, the appropriate curing ovens will be required, and the two are quite different; the Hot Melt oven is much hotter and will ruin epoxy connectors if used on them by mistake. If you use epoxy or anaerobic adhesives from your stock, check the expiration dates on all of them to make sure they are fresh. Also check for other consumables like wipes, isopropyl alcohol, cable gel cleaner and of course, connectors. Prepolished splice connectors have been getting better and easier to use. Newer termination kits include a quality cleaver like those used with fusion splicers and a visual fault locator to verify the internal splice. Since newer kits can now produce connectors that have lower losses, around 0.5 dB, a new kit (and perhaps some training) and the latest connectors could be a good investment. When checking out the termination kits, pay particular attention to the condition of the tools. Of course missing tools will need replacement, but hopefully that was done when the kits were inspected after the last job. However, jacket strippers, fiber strippers and cleavers can wear out or be damaged, so its important to check their operation with some sample fibers to see if they are working properly. Let me repeat that thought: It’s mandatory to check out every piece of equipment you intend to take to a job site to ensure its proper operation and let the installation crew reacquaint themselves with its operation. This process needs to be done with enough time to have the unit serviced or replaced and restock any consumable supplies. It should also be obvious that one never puts back on the shelf any equipment that has had problems in the field. It should immediately be replaced or sent out for repair to be ready for the next job or discarded. Let me caution you on another problem we have seen recently with tools. Several recent complaints of poor quality tools, especially fiber strippers, have led us to believe that poor quality imports are becoming more common. In one case, the tools appear to have been counterfeit, branded with a well-known American name. I suggest you purchase tools only from reputable sources and inspect them on receipt to ensure they work properly. Finally, as the equipment is checked out and readied for use, make certain that appropriate safety equipment is packed with the tools. Everyone who works with fiber needs safety glasses and clean, unscratched ones will make seeing those hair-thin fibers much easier. Black work mats for splicing and termination also help the installer see the fibers and find fiber scraps for easier cleanup. The fiber optic installer needs a complete set of fiber optic tools and test equipment, plus supplies used in pulling cables, splicing and terminating them, then testing and troubleshooting the installation. This is a fairly comprehensive list of these items, but no such list could be complete and some specific components may require special tools that are recommended by the component manufacturer. Note: Some processes require common hand tools such as screwdrivers, pliers, socket sets, wrenches, and even saws. Most workers will have a full set of hand tools.